Punch! 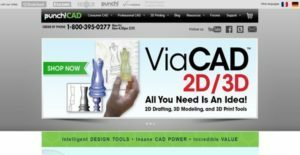 ViaCAD is an easy-to-use suite of 2D and 3D computer-aided design software the delivers valuable and productive tools to architects, engineers, CAD drafters, 3D printing experts, furniture designers, DIY hobbyists, and students. The software permits the creation of 2D drawings and sketches; architectural, mechanical, and electrical designs; schematics and plans; and 3D models and prototypes. The CAD program is equipped with comprehensive sets of design, drafting, modeling, and prototyping tools which enable users to achieve flexibility and precision as they work on their projects. It allows them to transform 3D models to 2D drawings with ease, and enhance their drawings through the aid of its drawing tools. With Punch! ViaCAD, 3D models can be edited intuitively. Last but not least, the software offers advanced solid modeling and drafting toolsets that are ideal for designing parts and objects. Punch! ViaCAD comes with features and functionalities that are exclusively built for 2D design and drafting. Whether users want to create simple 2D sketches or production-ready schematics, diagrams, and drawings; the CAD design software gives them powerful 2D drafting and drawings tools to make their tasks much easier. With its 275 drawing tools, users will be able to produce drawings, layouts, schematics, and plans easily and precisely. Punch! ViaCAD also delivers tools that enable them to come up with accurate measurements and add notes to their drawings quickly. In addition, it allows the conversion of 3D models to 2D drawings. Punch! ViaCAD is equipped with 3D modeling tools and capabilities that make the creation of 3D architectural plans, mechanical plans, electrical schematics, and furniture designs a breeze. It supports the modeling, blending, chamfering, and shelling of solids, surfaces, and meshes. The CAD design software provides users with 3D printing capabilities. It lets them create files for popular 3D printers and provides tools to check whether their 3D models and designs will look good when printed. There is a powerful feature in Punch! ViaCAD called LogiCursor, which is applicable for both 2D and 3D drawings and designs. This is an intelligent tool that helps users create drawings and designs with precision. As they draw using mouse and cursor, this tool makes suggestions for the succeeding actions. Punch! ViaCAD has a professional version which is built with solid modeling and drafting tools to assist users who are designing products and packagings. Named as ViaCAD Pro, this version of the software provides them with the capability to create advanced 3D prototypes, photorealistic renderings, and manufacturing designs. They will be able to convert ideas into 3D concepts quickly. ViaCAD Pro offers NURB surface modeling tools which let users create and design complex organic shapes. NURB stands for Non-Uniform Rational Basis Spline, and it is a type of model used in computer graphics the gives mathematical representations of surfaces and curves. In order to refine meshes and transition from course to smooth surfaces, the advanced CAD software uses subdivision technology. Additionally, ViaCAD Pro offers architectural and woodworking tools which include rabbet, miter and dovetail joints, and pocket holes. If you are considering Punch! ViaCAD it might also be a good idea to investigate other subcategories of Best CAD Software gathered in our base of B2B software reviews. Each enterprise is different, and can require a special CAD Software solution that will be designed for their business size, type of clients and employees and even specific niche they deal with. We advise you don't count on locating a perfect software that will be suitable for every company no matter what their history is. It may be a good idea to read a few Punch! ViaCAD reviews first and even then you should keep in mind what the software is intended to do for your business and your staff. Do you need a simple and straightforward service with just essential features? Will you actually use the complex tools needed by experts and large enterprises? Are there any specific tools that are especially beneficial for the industry you operate in? If you ask yourself these questions it is going to be much easier to find a solid app that will fit your budget. How Much Does Punch! ViaCAD Cost? PowerPack v10 – Brings overs new 70 new tools to the existing functionality of ViaCAD v10, including tools to repair and validate models for 3D printing. Insane power at an extraordinary price. Powered by advanced drafting and solid modeling functionalities, ViaCAD Pro allows users to achieve sophisticated photorealism and 3D prototyping capabilities in the designs that they make for their projects. We realize that when you make a decision to buy CAD Software it’s important not only to see how experts evaluate it in their reviews, but also to find out if the real people and companies that buy it are actually satisfied with the product. That’s why we’ve created our behavior-based Customer Satisfaction Algorithm™ that gathers customer reviews, comments and Punch! ViaCAD reviews across a wide range of social media sites. The data is then presented in an easy to digest form showing how many people had positive and negative experience with Punch! ViaCAD. With that information at hand you should be equipped to make an informed buying decision that you won’t regret. What are Punch! ViaCAD pricing details? What integrations are available for Punch! ViaCAD? Punch! ViaCAD supports integration with AutoCAD 2017. If you need more information about Punch! ViaCAD or you simply have a question let us know what you need and we’ll forward your request directly to the vendor.